What is there to do in Norway during winter? PLENTY! For our winter trip, we wandered to Norway and it has been one of our best trips yet! We wanted to see the northern lights but knew it was never guaranteed, so we booked other excursions to make our trip worth while such as dog sledding, reindeer rides, and whale watching. Josh was working with a producer that has a friend who has a travel business called Off The Map Travel, specializing in trips to the Arctic Circle to find the northern lights. After a few emails back and forth with Katie, she sent us an itinerary that we could adjust to our liking. One thing listed on our itinerary was spending the night in a Sami lavvu (teepee). Josh was very excited for this, but I didn't like the idea of spending the night in a tent in the cold, it sounded awful. Katie assured us it would be warm and everyone loves it. Fine, we'll try it. I still wasn't completely convinced but agreed to it for some reason. Anyway, we finalized our itinerary and it was perfect to our liking (well, almost). Next steps were to book our flights and purchase warm clothes since this California girl doesn't know what to do in the snow but want to build a snowman. Since we were in Syracuse for Christmas, we flew SAS from Newark to Oslo to Tromsø and upgraded to business class for more comfort to hopefully get some sleep on the plane. SAS Business class was really nice complete with a large screen in the seat in front of you and a decent selection of entertainment. The food was ok, not your typical American meal, the venison was very tough, but the wine selection was fantastic. Best part was the ice cream, of course, they served 3 Twins Ice Cream - sea salted caramel! SO DELICIOUS! We arrived in Oslo, went through customs and continued to baggage claim to get our bags to check them in again to get to Tromso. After landing in Tromso, our taxi driver was there to pick us up and take us to our hotel, the Clarion at the Edge. The Clarion is a newer hotel, very modern and eco-friendly. To power the lights in your room you have to put the key in a switch and they all illuminate. 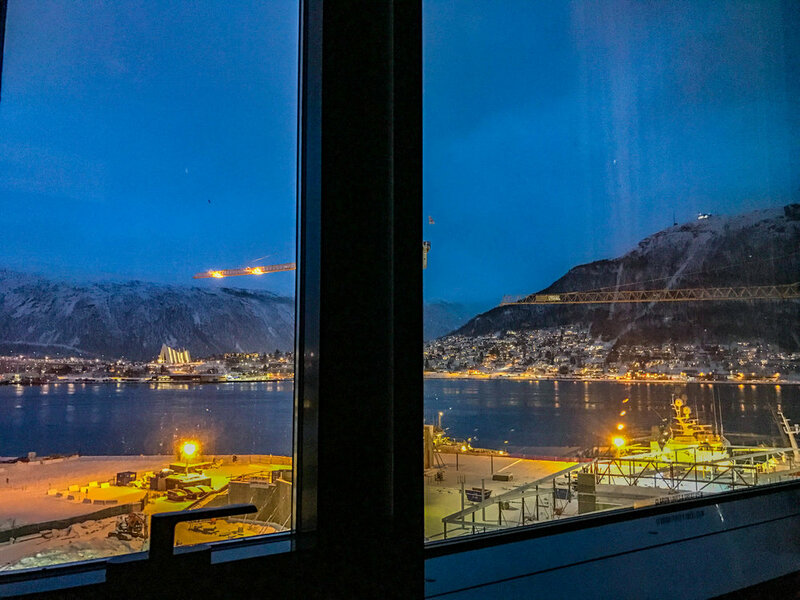 Our room overlooked the Tromso Sound towards the Arctic Cathedral. Apparently, they are building a port right in front of the hotel so there were 2 giant cranes obstructing our view. The beds were very comfortable and the bathroom is very tiny. Stressed Spelled Backwards is desserts! YES IT IS! We had about an hour before we had to meet for our dog sledding adventure, just enough time to grab a bite. Right around the corner from our hotel was a Tapas bar called Presis serving Spanish and Arctic Tapas. 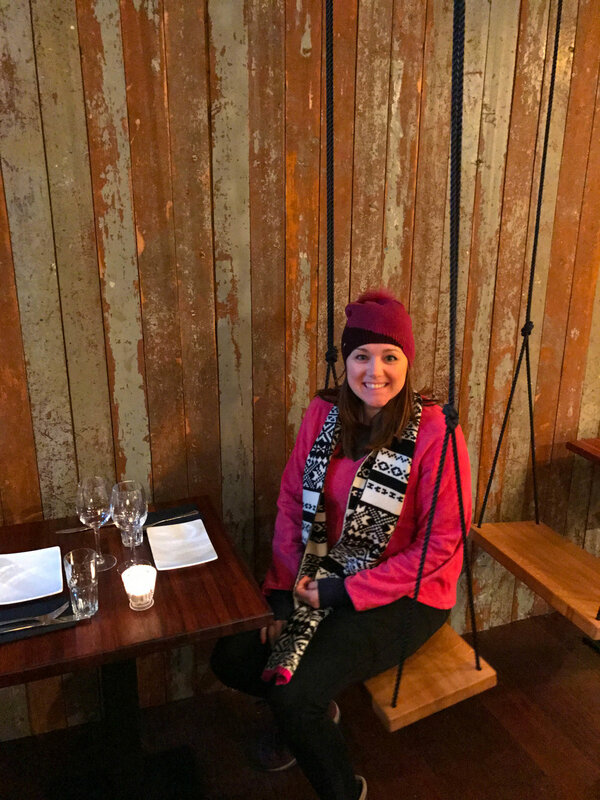 Upon entering, the candle light from the tables gave a cozy and welcoming vibe, and my eyes lit up when I looked over observing that instead of chairs, some of the tables had swings! The four-year-old inside me wanted to run over and sit on one instantly, but instead, the hostess sat us at a table with plain old regular four leg chairs by the window instead. It was probably for the better because I would have played on the swing and knocked over food, water, or a candle with the potential of lighting the restaurant on fire. So instead, I sat for a quick picture. The food was delicious. We had their ham, bread with salt and olive oil, potatoes with a garlic aioli sauce and spicy meatballs. It was the perfect amount of food for the 2 of us, almost too much! We quickly walked over to the Scandic Ishavshotel where Arctic Adventure Tours had a small bus was there to take us up to see the puppies! It was about a 30 min drive to our spot and as soon as we got off the bus I ran straight for the dogs! They were chained to little dog houses and jumping in and out of them, excited we were there to visit and give them attention! We were called into a room to suit up and get a winter suit, boots, gloves, and a head lamp for our sledding. It was probably for the better to wear their gear since the dogs were so smelly (but still so cute) it wouldn't stink up our clothes on our first day. We had a quick orientation and headed to the sleds. The dogs instantly started barking and jumping with excitement when they saw us! We jumped in our sleds and they untied each sled team one by one and off we went! The dogs run fast and are good about following each other. They are even skilled to run and poop at the same time. Lol. I liked riding more than driving! You have to do a little peddling/running when going up hills, the pups get a little tired and need a boost! 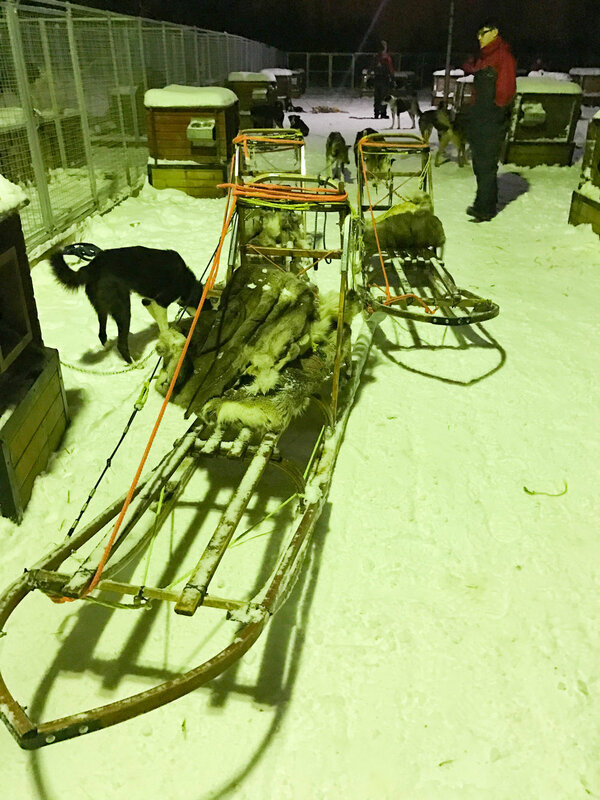 Our sleds had pelts to sit on to make it more comfortable! And off we went for about an hour! We saw so many stars and got caught in some snow! The hotel provided a free buffet breakfast in the morning at their restaurant, with tons of options from pancakes to an omelet station. Our first adventure of the day was a reindeer sleigh ride! We walked over to the Radisson Blu and got on a small bus of about 14 people to the Tromso Lapland. It was a 20 minute drive to the Sami lavvu where we changed into a winter suit and gloves provided by the tour. We jumped back on the bus and drove another 20 mins to the reindeer. After a small hike up the hill, the reindeer were waiting for us by a bunch of sleighs. I leaped to them (literally, I was that excited)! Of course I had to pet them and take tons of pictures, which I'm sure they loved me invading their personal space. It's what I do best. Soon after, we were all seated and ready for take off. The reindeer don't run quite as fast as the dogs, it's a slower paced, more peaceful ride. This was a once in a lifetime experience. Not only did we have a reindeer ride, but we also learned of the native Sami culture. The reindeer ride consisted of about 7 or 8 reindeer pulling individual sleds. They are connected by ropes and then all sleds are connected one by one. At first, the guide was leading the reindeer up and around the hill and then hopped on the sled and away we went. The ride lasted about 40 mins total and was very peaceful trekking through the freshly powdered snow. for 3km. After our ride, they tied the reindeer in a more open area, where we were able to feed them! Most of the time they would knock the food out of my hands and almost force me out of the way with their antlers to eat the remains from the snowy ground. I did get to pet them, their fur is coarse and some of them even had fur fuzz on their antlers! We then moved locations to a traditional Sami Lavuu (it looks like a teepee) with an authentic Sami guide where we had reindeer stew for lunch while being told stories of their culture along and even a joik (Sami song) was sung for us. Our guide was from a Sami reindeer herding families explaining how valuable reindeer are enriched in their culture. A storm came in so strong that the rain from it turned into icy roads. We were supposed to go out to see the lights but the bus wasn't going to be safe in the icy conditions and we had to cancel our tour. We weren't surprised, it was still overcast and others who had gone out the night before drove 2 hours to Finland to see the Northern Lights, some weren't able to catch them at all. Instead, we went to Huken Pub right around the corner of our hotel. We had some time to kill, where we just wanted to sit and have a beer. This was the perfect place. The decor is unique, suitcases as tables and barn chic interior. The people sitting next to us had burgers that looked amazing but we had just had dinner at the hotel. They had a vast selection of Mack beers along with a few others. Not great for large groups as it is a small place inside and doesn't really have a bar to stand at. It's cozy and perfect for 2 people! After a couple drinks, we walked around for a bit and enjoyed the charm of this quaint town. It was finally our day to go whale watching and we were so excited! I was a little apprehensive as to how cold it was going to be, with being on the water and rain in our forecast, but they said there were warm waterproof suits to wear. Perfect, now my clothes won't get wet and I'll still be warm! Win, Win. We booked this excursion through Off the Map Travel and our whale watching company name was ACIN (Arctic Cruise in Norway), we boarded the Arctic Princess, a Lagoon 450 Catamaran. A fellow tour company had spotted a pod of killer whales and gave a call to our captain. We drove straight towards them. WOW! There were probably about 10 Orcas in the pod and they would surface now and again where you could see their prominent white spot near there eye. They weren't jumping out of the water like Free Willy or Shamu at Sea World, but it was still mesmerizing to watch these beautiful creatures. The whales didn't seem bothered by the surrounding boats at all, coming fairly close to a couple of them. There was a flock of seagulls trying to get in on the whales feeding situation. We could see where the pod was heading based on where the birds were circling. You could tell when some would surface as they would give a burst through their blowholes. We checked out of our hotel (we told them we needed a late check-out so we could shower and I'm so glad we did! Off the Map travel had arranged our transfer over to the Lyngen Alps. When we arrived, we met Ann Kristin with Aurora Alps, who was in charge of our tours for the next few days. We were supposed to stay in a cabin the first night, so I had one last night to get used to the idea I would be sleeping in a teepee, in the snow. However, they told us our Itinerary had changed and we were spending that night in the teepee. O.M.G. She made it sound like it was no big deal and that it would be easier for us. I was anxious and nervous inside. We grabbed our bags and walked to the lavvu (teepee) which was about 50 feet from the house with a lit path and charming white lights strung in front. HOW ENCHANTING! I then forgot all my fears, and as we entered the candle lit lavvu, I loved everything about it. There was a giant picnic table with food, a bar with hot drinks ready to go, a warm stove with lots of firewood, comfortable living room setup, and a separated area with sleeping bags. Along with the candles, there were some lights strung along the top of the lavvu giving off plenty of light. I was mesmerized and felt like I was in another world. This was my kind of camping, as long as the fire kept burning! In front of our cozy lavvu, were 2 sets of snowshoes. They were cute and I took a picture but didn't know how to use them. Ann Kristin had advised the Northern Lights would be out that night and we should use the snowshoes to get to the clearing not far from the teepee. We gathered all of our camera gear and Josh helped me get my snowshoes on and off we went. We found the clearing but the sky was cloudy and there was a light rain. We decided to wait a bit and see if the weather would clear up. After about 15 minutes, we started to see stars and the clouds started to dissipate. We thought we were looking for green flashes or some kind of light in the sky, but didn't see anything like that. Josh decided to take pictures of the stars while we waited for the aurora borealis to show. After a few pictures, he yelled, "THAT'S IT!" There it was, on his camera screen, green Northern lights! We realized they looked more like glowing clouds to the naked eye! "What about that?! Or that?!" We shot at everything in the sky, taking tons of shots and getting something a little different every time. We were excited we were able to see the lights on our first night and couldn't wait until we were going out with a guide the next night! We checked out of the teepee and stored our bags with Aurora Alps, which they brought them over to the cabin next door later that day. We went back towards Tromsø but stopped just after the bridge for our day dog sledding tour! There were so many cute smelly pups that were so happy to see us! We felt like pros since we had already gone dog sledding at night in the dark! We put on our suits over our clothes and jumped on our sleds. It was kinda rainy and it seemed like the path they were taking hadn't had snow in a while. In certain areas it was almost like water skiing which was fun but since it was raining, water had somehow leaked into my suit, and I was wet and very very cold. We warmed up and had some lunch in the community room (and lots of hot chocolate!). We had a private tour, arranged by Off the Map Travel to go see the Northern Lights. We looked at the weather pattern and hoped we could see the lights and not too many clouds! Our driver picked us up in a large van at our cabin and took us about an hour North of us where the weather was better, and we even drove into Finland to find the Northern Lights! We brought all of our camera gear and ANYTHING to keep us warm. What are the northern lights exactly? Well, the Aurora is an incredible light show caused by collisions between electrically charged particles released from the sun that enter the earth’s atmosphere and collide with gases such as oxygen and nitrogen. The lights are seen around the magnetic poles of the northern and southern hemispheres. After a many stops over 3 hours, it was time to head back to the cabin. We were beyond thrilled we were able to see the lights. We were exhausted by this point, we had done so much in 4 days! We finally slept in a bit, but I was still excited to try Cross country skiing! Since it was my first time, I may have fallen a couple of times, but overall was fun since it was something I had never done before! My thighs were definitely sore the next day! We took in the scenery, being secluded in the woods and even saw moose tracks! We stopped at their cabin in the middle of the woods which had no power, but a cozy area for a fire to cook hot dogs and have some hot cocoa from a thermos! We signed the guest book hoping we'd return one day! As we were enjoying our last night in Norway, we went to dinner in the main hall, and then went out at midnight for the neighbors fireworks show. The law allows fireworks to be shot off only on New Years Eve night from 11:30pm to 12:30am. 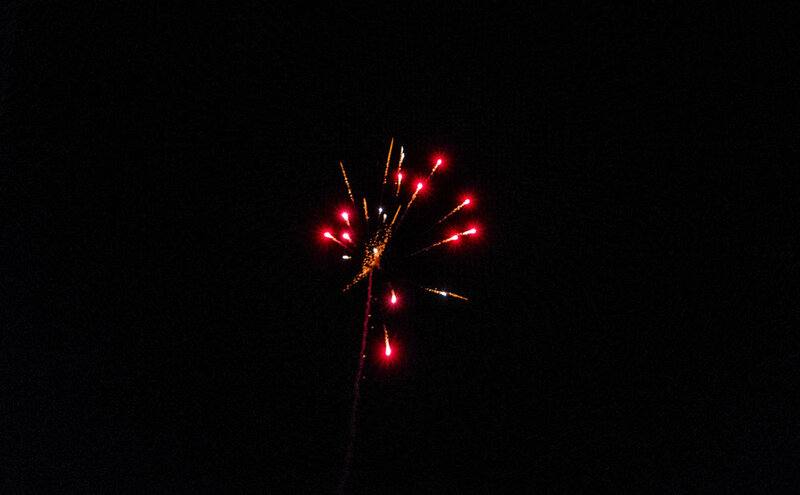 The neighbors gather together to compete against other neighborhoods for the best fireworks display! At about 1am the skies started to clear and the Northern Lights were directly above us! We got the GoPro and the rest of our gear and setup for a light show! There was a glow and we were glad we were to able to see them one last time, or so we thought. We went inside for about an hour to warm up and get ready for bed. Josh went out one last time to take a look and came back yelling, "come out, come out!" I ran outside and could actually see them without a lens! We went inside again to warm up and edit some photos to show our family and friends at home. It was getting close to 5am and it was time for bed. As I got into bed and was scrolling threw Instagram, I heard Josh open the door and then a minute later, he yelled, "they're back, come out!" We went running out and there were bright green streaks across the sky! As I was looking in the sky, one of the glowing clouds got brighter and greener and started moving! I turned to Josh and said, "look at that," pointing at the green streak! This green streak only got brighter and brighter and danced across the sky, dazzling different colors of white, green and blue as it moved. It was the perfect way to end our 5 day trip to Norway and great start to a new year!